Why all the fancy technology in most movies? In most of the movies and TV-series I have watched, whenever there is some kind of "technology" involved (say, like a tracking device or hacking something important), there is a lot of unnecessary, impractical key-pressing and fancy colors and sounds (a lot of 1's and 0's going on the screen and a lot of "beep"s). For example, take the TV-series Primeval. Their device for tracking anomalies have a lot of the things said above. Why do movies and TV-series employ this kind of false-looking tech? It would have been much easier to use a real OS (like MacOS for normal things and Linux for hacking-kind-of things), maybe with a custom-made software suited to the task. It would have been more realistic. So is there any specific reason for this? Well, I think there is perfect reason for it: audience appeal. Of course those things are totally unrealistic and over the top, but show a simple black-and-white console to the audience or a basic database application and they will just find it boring to look at or think there is not much to it. Of course it bothers the hell out of those who know better, but the average guy that uses his computer for YouTube, Facebook and maybe Office is just more pleased with colorful displays and stunning graphics in a simple database query and is more likely to accept that there is something interesting going on. It's about conveying the information inherent in those abstract and hard to grasp processes in an interesting and entertaining way, thus sacrificing some realism for the sake of story-telling. I think one reason is that it explicitly divorces the tech in the show from real world tech. This allows writers more freedom because there isn't going to be some expert somewhere saying "That isn't how you use regular expressions!" If the tech is "fancy" then only those in the show are the experts. Sorry I'm so late to the party on this one, but I thought I'd share some of the research I've found for a academic project, so here's my contribution. KennyPeanuts and Wonko the Sane both give interesting examples, and Napoleon Wilson cuts to the heart of it, but all three answers hint towards but do not explicitly discuss the wider trend they are discussing. Tecnho-Fetishism is a piece of wide terminology identifying behavior/preference that privileges the use/appearance of advanced technology, traditionally associated with the Sci-Fi/fantasy genre but more recently expanding across all areas of artistic/commercial enterprise. Techno-fetishism is inherently attached to the Computer-Age, but has only truly blossomed within the Modern (current) Information Age. The concept of techno-fetishism is alleged to have been borne out of commerce, which is a problematic claim as it eliminates any notion of an organic cultural preference, in favor of a marketing model. That being said, Tech Companies such as Apple and Samsung have seemingly identified this consumer trend, and appear to be exploiting it for commercial gain. This is probably due to more advanced technology being widely available within the domestic market, influencing notions of commodity. Techno-fetishism is also closely linked to the legacy of Futurism, and the two terms can often be found being used interchangeably. This is fine, but Futurism is more of an aesthetic movement and Techno-Fetishism is considered a behavioral model. Japan is obviously a huge proponent of the movement, both culturally and artistically. The Japanese term Otaku is a derisive description of a Tecnho-fetishist, although its negative connotations seem to have been lost in translation in the process of western circulation. There is a lot to be researched here, as Mecha-Anime is surely one of the most functionary conduits of the 'genre'. Modern 'Mainstream' Cinema, in a typical reflection of the modernity, seems to be adopting techno-fetishism reflexively. It's perhaps still very early days, and hasn't seemed to have been fully explored/identified academically (hence my research), but technological interface seems to be a staple of many movies, sometimes the theme itself. The Spike Jonze movie Her is a very interesting example, and perhaps ahead of its time (even though it is yet to be released!). Another good exploration of the way we interface with technology is The Entire History of You, a very good episode of Charlie Brooker's Black Mirror. The two are thematically similar, but seem to directly address modern cultures addiction to technology in a very mature way. As Wonka the Sane skirted around, advanced technology is often 'air-dropped' into movies, and can often be jarring. 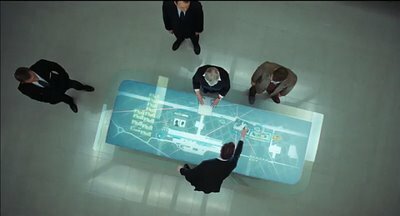 I personally think the high-watermark of this trend is Quantum of Solace, where the 'Sci-Fi table' seems to be a totally unnecessary demonstration of tech-for-the-sake-of-tech. The MCU is a franchise that has readily adopted Techno-fetishism, and Iron Man remains the most exploratory of these trends. The Studio should be congratulated as a powerful example of how cultural preferences can be seamlessly stitched into pre-existing canon's, through camouflage and concealment. Iron Man-Techno-fetishism Tony Stark, is a GatesJobsian avatar of technology and commercial responsibility, being an representation of futurist altruism. Thor-Mysticism The Asgardian world is a beautifully rendered demonstration of Historical/Fantasy mysticism, and openly signals and engages fans of such a genre. Captain America-Nostalgia Whilst outwardly imperialistic, Captain America is actually a felicitous exploration of America's Modern Cultural identity by exploring old fashioned ideals of heroism. The First Avenger also capitalized in the 1930s/40s retro-styling that has emerged within wider fashion, a preference elicited by Vintage clothing. I realize that the question you have asked is not about MCU, but I hoped to demonstrate how Iron Man is an example of a commercial entity recognizing and exploiting the very trend you have yourself identified, and demonstrating how it is only part of a wider marketing strategy. The reason why there is so much 'Fancy Technology' in movies is because there is an active market for it, and movies will always respond to market forces favorably. Mainstream Movies will exploit the visual language of technology, and more artistic features will criticize and explore our interaction with it. This is nothing especially new, but it is accelerating in pace. Mainly, because it follows the basic principle of "do it like somebody else, but maybe flashier." It is a simple audio/visual cue that viewers are used to. It's really no different than hearing a "slap" sound when somebody gets punched (instead of a thud), or somebody flying backwards when they get shot, or zooming in on a license plate from a hijacked satellite feed with a half-dozen key strokes (and no mouse). an interesting case study here is use of computers and computer-like systems in movies. here are several well researched articles on Wired site on this topic which shed some light on the question. Computer in movies suffer from one major problem. Real computers are boring. To juice things up, movie makers tend to add spinning, glitzy interfaces, perfect voice recognition and security that can be cracked in seconds. For decades, the AN/FSQ-7 -- Q7 for short -- helped define the image of a computer in the popular consciousness. Nevermind that it was just a radar system originally backed by tens of thousands of vacuum tubes. For moviegoers everywhere, this was the sort of thing that automated myriad tasks not only in modern-day America but the distant future. in other words some of the original flashy computers were real "control" or "monitoring" systems. (but not necessarily computers). they seemed to have high audience appeal and their design inspired later fake props. in other words decades ago, some real control systems actually were very flashy and colorful and these real systems were used in the movies and influenced later props. some of the real systems were reused in many movies. I disagree with the general tenor on this page that technology is fancy in movies because people like fancy technology and get excited to see it. Apart from production design geeks, it doesn't make sense to me that an audience would choose to go see a movie for some fancy interfaces. They aren't a centerpiece like big action sequences or character development, they're typically a means to an end. However, in most cases, that end does require technology that is different from realistic modern-day tech. Chances are, if someone is looking at a screen or an interface in a movie or TV show, there is important information being relayed, either about something happening in the character's world or about how the character is solving the problem. "Fancy technology" may be more visually pleasing to look at, but it's also more suited to get the most important plot information across quickly. Instant plot communication: Half a season of Doctor Who revolved around this kind of instantly legible technology. The show was able to use a highly stylized pregnancy scan screen to bring up a recurring storyline in seconds. Disregarding how incongruous a Earth operating system would seem on the TARDIS, anything with a similar workaday tech aesthetic wouldn't have handled the storyline as well. Character development: Using John Smith's background of the MCU, a perfect example of "fancy technology" performing important character development is The Avengers. Tony Stark's most important character trait is how he thinks. The movies wouldn't be engaging without all of the scenes where he is doing nothing but inventing or figuring out a problem on his own. As for why technology is important to making that interesting, compare the scenes of him inventing the suit for the first time with later scenes back in America with Jarvis. Technology makes being alone interesting and allows the audience into his thought process, without forcing Pepper to constantly be his exposition buddy. It allows a whole new character and humor dynamic to emerge. Illustrating relationships: Granted, I can't think of a good example of this outside of The Avengers but their use of technology is my favorite. Twice in the movie, technology helps hit emotional points in cleaner, quicker and more effective ways than other methods. First is when Stark and Banner are first interacting trying to chase down the cube (I think, I'm fuzzy on their objective). Stark and Banner are two geniuses, and showing how they work together, and how Stark continues to push Banner as they work is an essential part of their storyline and best told through tech. That moment when Stark minimizes all of the windows on the transparent glass display is perfect. In the same movie, Stark attempting to call Pepper one last time before his sacrifice, with that portrait of her inside his helmet, is more affecting than an actual conversation would have been because it allows the audience member to fill in the emotional dots. Defining worlds: Sorry, I keep coming up with examples from the Marvel universe. Their use of tech is on point. It is important for the MCU that the Asgardians aren't actually magic or gods, they're just highly advanced aliens. This is made clear in Thor: Dark World when Jane Foster is entranced by the interface of the medical technology used to help her. When they tell her it's a "soul forge", she figures out the underlying science and describes it in terms of human technology. It's a great moment for showing what kind of a thinker and person she is, and it shows that the Asgardians are just highly advanced, not magical. All of these more pointed, plot-oriented uses of technology would be impossible or highly difficult. Iron Man doesn't have Android installed on his suits not because people would get bored and spend less money on his movies, but because Android wouldn't tell his story as well. Granted, these are some of the best uses of technology I could think of, I know there is a lot of warrantless techno-fetishism out there. Not the answer you're looking for? Browse other questions tagged film-techniques . How does Iron Man's costume serve to emphasize the aspects of his character? How do they film the mirror scenes in movies? Why are most scenes in a car recorded with chroma? Why do they often hide the money figures in TV and movies? Why are not all IMAX theaters domed? Why do most space movies contain sound? Why do almost all Woody Allen movies contain the same font style? What technology or method is used for the making of “Chicken Run”? How are the airplane scenes shot in movies? Why do all flashbacks show the person who's remembering it as if they're being filmed?